Coral reefs around the world are up against a multitude of stressors ranging from localized to global threats. At the local scale, dynamite and cyanide fishing, ship groundings, and excess nutrient input from coastal development can have grave impacts on coral reefs. On a global scale, warming sea surface temperatures leading to mass coral bleaching events is the main driver in coral decline. With the latest technology, we can track sea surface temperatures and even predict when and where a major bleaching event could occur. 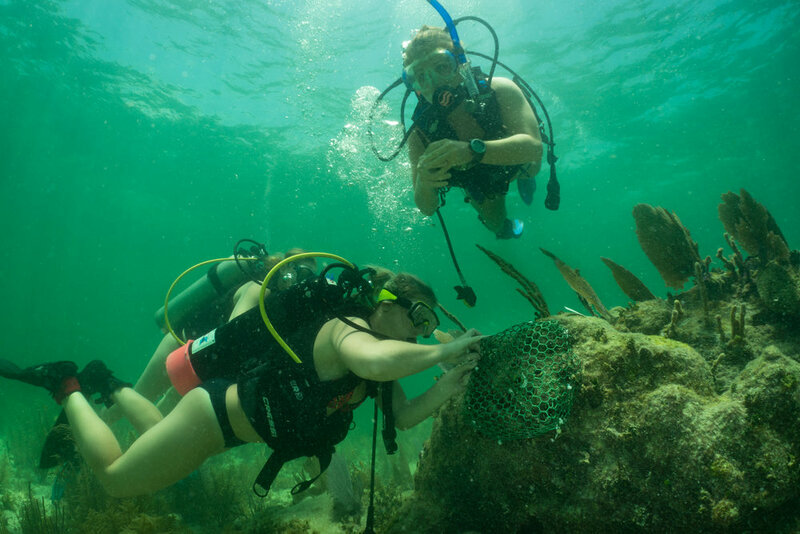 However, in the last ten years, the field of coral restoration is becoming increasingly popular with many groups of coral biologists testing new methods to restore the worlds coral reefs. In the Caribbean alone there are over 85 projects working to restore coral reefs, primarily focusing on corals in the genus Acropora. Elizabeth Moore International Center for Coral Reef Research & Restoration in the Florida Keys shortly after the completion of the new building. In the Florida Keys is the Elizabeth Moore International Center for Coral Reef Research & Restoration, which is a branch of the Mote Marine Laboratory headquartered in Sarasota, Florida. 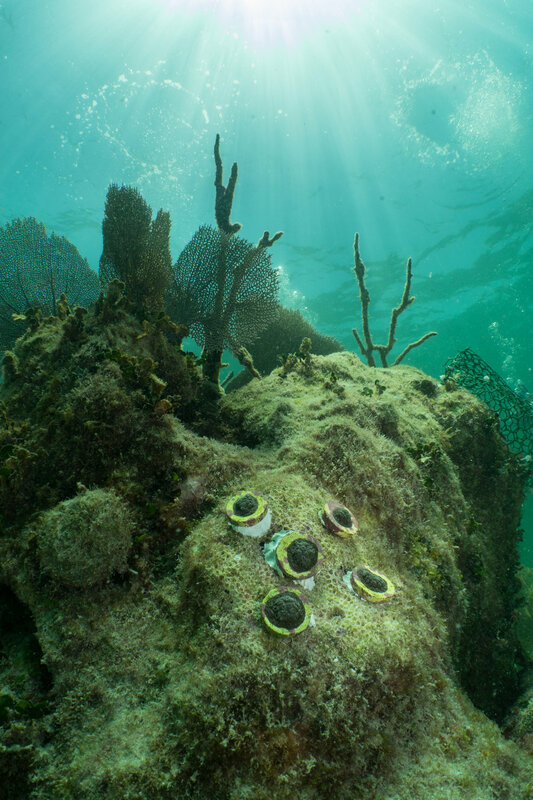 Mote's facility in the Florida Keys has been one of the leaders in coral restoration, specializing in microfragmentation, propagation, and outplanting of many of the massive bouldering corals. Working with these species makes this project a little more unique, since the majority of coral restoration in the Caribbean focuses on Acropora cervicornis (Staghorn Coral) and Acropora palmata (Elkhorn Coral) due to that these species have faced massive declines over the past 30 years. Acroporids are also very fast growing relative to other corals, meaning it's possible to restore them and see substantial results within a few years. Mote's field nursery focuses primarily on Staghorn Coral, but has begun to propagate many of the massive corals as well. 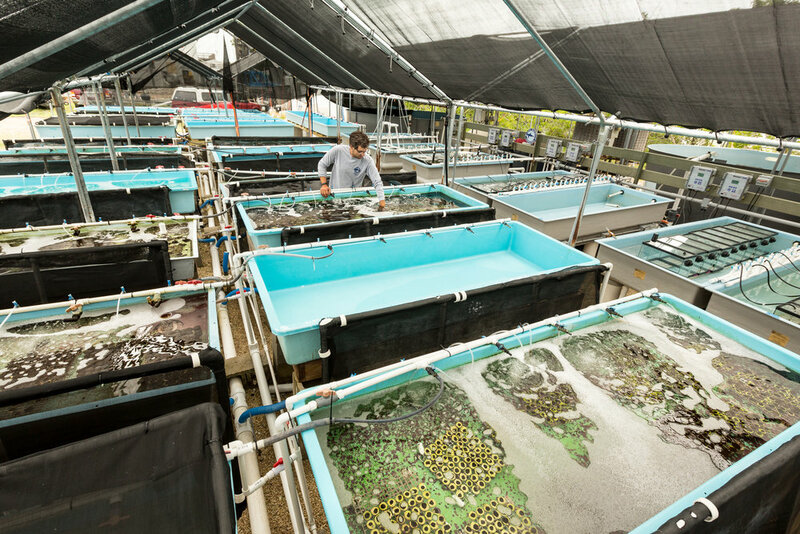 On the land based nursery is where the massive corals are propagated in large quantities with currently over 29,000 fragments at the facility. 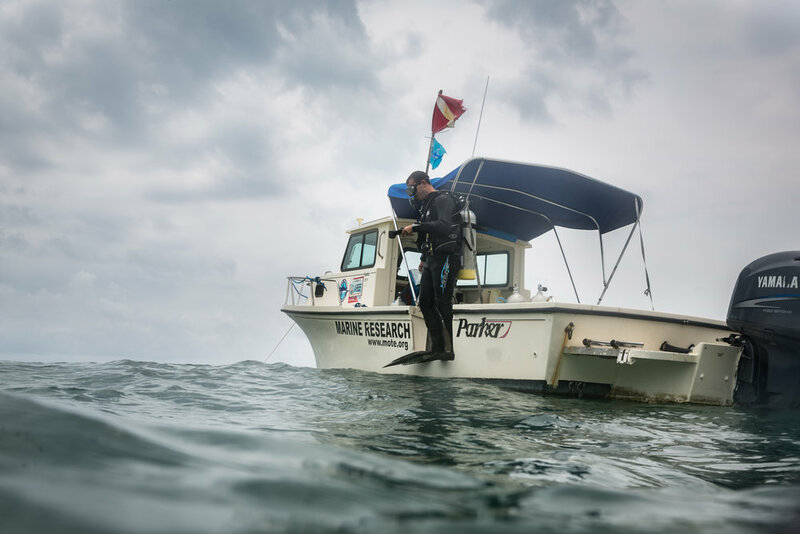 There are many methods for restoring coral reefs, and depending on your location, species, or funding available, those methods may be drastically different. At Mote, the land based nursery specializes in a process called microfragmentation. 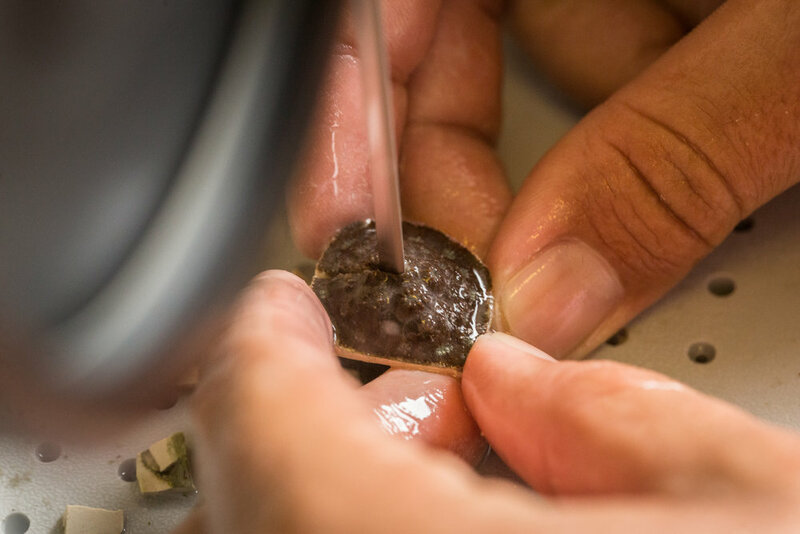 This is the process by which you take a piece of coral slightly larger than a quarter, and use a wet band saw to fragment it into 1cm X 1cm pieces. Since corals are colonial animals, this seemingly destructive practice allows each fragment of coral to survive. 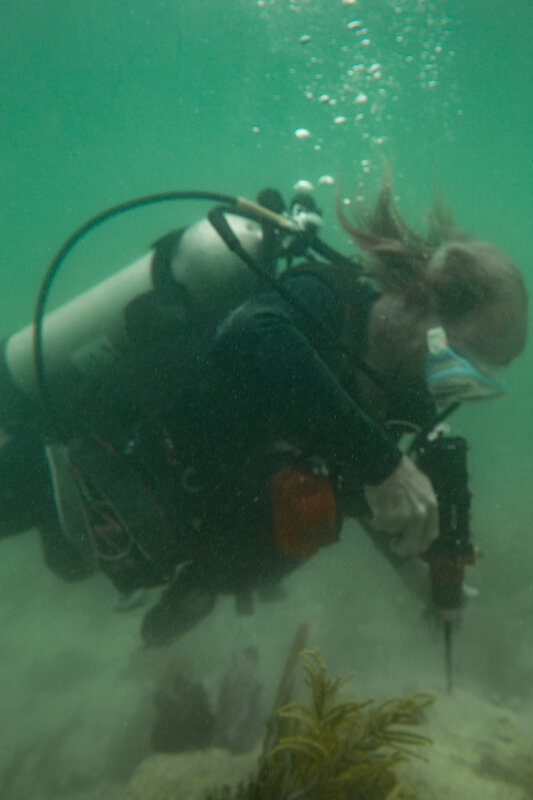 Cutting the corals into small pieces has two main benefits for restoration projects. First, the total surface area where new growth can arise from increases with each new fragment putting out new growth around its outer parameter. Second, research has shown that the microfragmentation technique actually increases growth rates up to 10-15 times faster than in the wild, which is best equated to a rapid wound healing response. 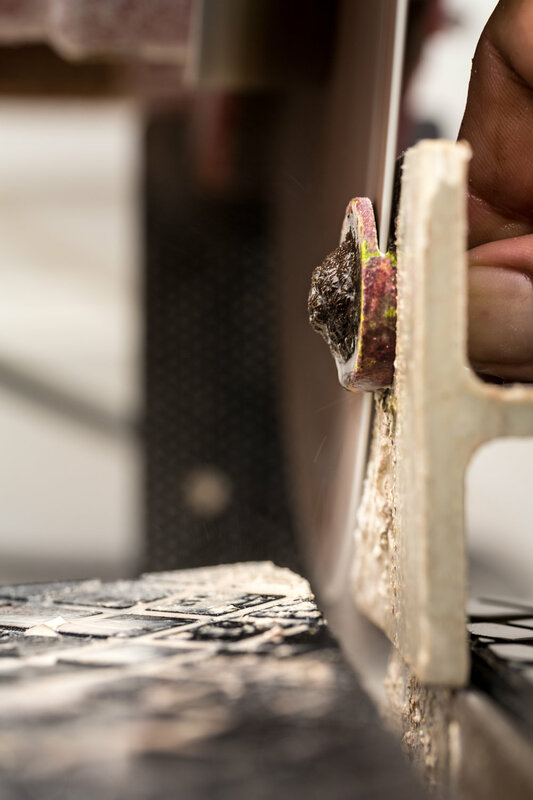 For many of these slow growing bouldering corals, which may only grow a few millimeters a year, this process makes it possible to work with a wide variety of species, and see substantial results within a relatively short period of time. After a 6-8 month grow out period in the laboratory, post microfragmentation, it's time for outplanting. But how do we restore reefs with 1,000's of fragments of coral not much bigger than a quarter? Any group of fragments that was cut from the same parent colony is an exact clone of itself. Through experimentation, we've learned that when corals of the same genotype grow into each other, they will fuse together back into one large colony. Think of it as cutting yourself up into many different pieces, letting each of those pieces grow larger, then fusing them back together into one giant version of yourself. However if you try fusing different genotypes, they will have the possibility of waging war against each other. When it comes time to plant them on the reef, fragments are frequently outplanted in arrays similar to a pepperoni pizza, where each pepperoni is a fragment of coral. Within 3-4 years after outplanting, arrays have been documented showing complete fusion. Once fused back together into a large colony, many of these arrays will be at reproductive size meaning they will hopefully begin to spawn and produce offspring of their own on the reef, thus increasing the genetic diversity. By using these methods, coral fragments fuse within 4 to 4 and a half years. If every fragment was placed as a single, it could take 15-20 years to reach the size of a fused array. Southeast of Big Pine Key is Newfound Harbor, an inshore patch reef, which has suffered severe instances of coral bleaching. This is one of Mote's primary outplanting locations where there are multiple arrays that have fused completely back together. Off the coast of Key West, Fort Zachary Taylor Historic State Park is a popular destination for tourists and those who wish to snorkel from shore. For the past 2 years Mote has been building a snorkel pathway behind the breakwaters using various species of bouldering corals. Below is a gallery of pieces of coral fragmented then fused back together. Each video corresponds with the above image. Stephanocoenia intersepta showed slower growth rates, and were not completely fused at the end of the three months. Each Acropora palmata showed complete fusion, while the Porites astriodes has grown into each other but it's unclear if they are fused as one colony. Interestingly, on the 5th Porites photo there is visible tissue death on one of the fragments, but by the end of the experiment, the tissue has grown back. Can restoration alone save coral reefs? Coral reef restoration is a booming science with many different techniques being applied. There are also many questions that still need to be answered in order for restoration efforts to have its greatest impact. Some may ask, if the environment is changing so rapidly, aren't all the corals you're outplanting just going to die anyway? Life has an amazing ability to adapt with a shifting environment, however, life can only evolve so quickly. By putting corals through stress tests, exposing them to elevated temperatures, disease, or lower pHs, we can find the toughest corals, and focus on particular genotypes for restoration. Many labs are also cross breeding their toughest coral in hopes of producing offspring with a higher tolerance to stressors. As methods improve, labs are beginning to see high yields in survival when fertilizing wild spawn. This is important due to that in the wild, fertilization rates are extremely low for many species. By increasing the amount of coral recruits, you have increased the genetic diversity far greater than what would occur during a spawning event on the reef. Increasing the genetic diversity may also benefit against disease. If restoration only used a few genotypes, this would make a large quantity of the outplants susceptible to the same adverse conditions. If one gets a disease, it could easily spread to the rest. This assisted evolution process could be one of the tickets for long term success in coral restoration. There are also efforts to examine the resilience of the corals symbiotic algae. 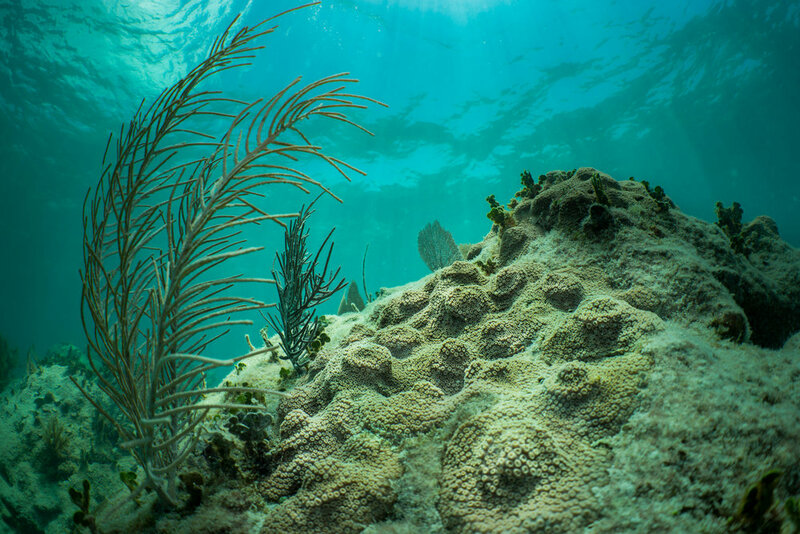 Certain clades of the algae have shown to be more tolerant of elevated temperatures, and it may be possible that corals can be infected with the more resilient algae, making them more likely to survive bleaching events. With the increasing efforts in coral restoration, techniques will only become more efficient, more affordable, and more successful.